FDS Super Mario Bros. 2 (JPN) "warps, Luigi" in 08:13.77 by HappyLee & KFCMario. This is a TAS of the Japanese Super Mario Bros. 2, a.k.a. 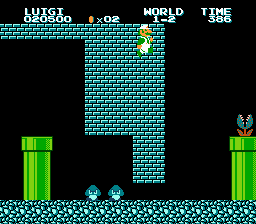 'The Lost Levels', using Mario's brother Luigi. He jumps higher than Mario, but acts slower in many ways. However, the movie is in no way worse than the Mario version - some new creative solutions have been found. This is an 110 frame improvement over the previous movie by Phil.